Luke Gregory designed the Urban Composter while studying Industrial Design at university. Luke is passionate about the environment and wanted an easy way to stop food scraps going into landfill. He looked into Bokashi composting – and even tried it once – but he found the bokashi bran hard to manage and discovered that it attracted mice and other rodents. He also didn’t like the fact that most bokashi systems aren’t where you need them. Because they attract bugs, most people don’t want bokashi composting systems in their kitchen near food. The problem was this: people won’t compost if it’s difficult. He felt that if people could compost kitchen scraps in their kitchen, more people would do it. He researched an entirely new anaerobic composting method that didn’t require messy bokashi bran and discovered that he could use a citrus-based spray to start the composting process. Luke then used his design skills to build a stylish prototype of a kitchen composting bin that would look good in his kitchen. A good seal on the bucket’s lid was essential – this would make sure that bugs and critters stayed out. He purposely focused on a sleek design that would conveniently fit in tight spaces, like under the kitchen sink. He built in a tap for draining bokashi tea and a detachable handle for carrying the compost pulp to the garden. His designed incorporated a combination of bright and neutral colours that would match any modern decor. In 2011 manufacturing began on the first Urban Composter Bucket. Luke’s mother Lynette became the marketing and distribution lead for the new product, and it made it’s debut at the famous Glee Trade Fair in England. Buyers from all over the world were impressed with the beautiful design and the simplicity of use. 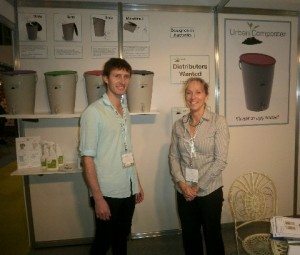 US customers first saw the Urban Composter at the Chicago International Homewares show in 2012 where it lived up to its promise as a stylish kitchen composting system. While customers liked the style and function of the Urban Composter Bucket, there were requests for a smaller version. Customers wanted a smaller bucket that fit in tighter spaces and could fill faster. In response the Urban Composter City launched in 2013. The family-owned company supports and sells product through a network of local distributors in the USA, Canada, the United Kingdom, Ireland, Sweden, New Zealand and Australia.